Spray bottoms of 2 microwavable mugs (about 12 oz each) with cooking spray. In small bowl, stir Bisquick mix, sugar, cinnamon, banana, melted butter, egg product and vanilla until mixed well. Stir in nuts. Divide batter equally into mugs (about 1/3 cup batter each). Microwave one at a time uncovered on High 45 to 60 seconds or until muffin top is set and edge pulls away from side of mug; let stand 1 minute before serving. 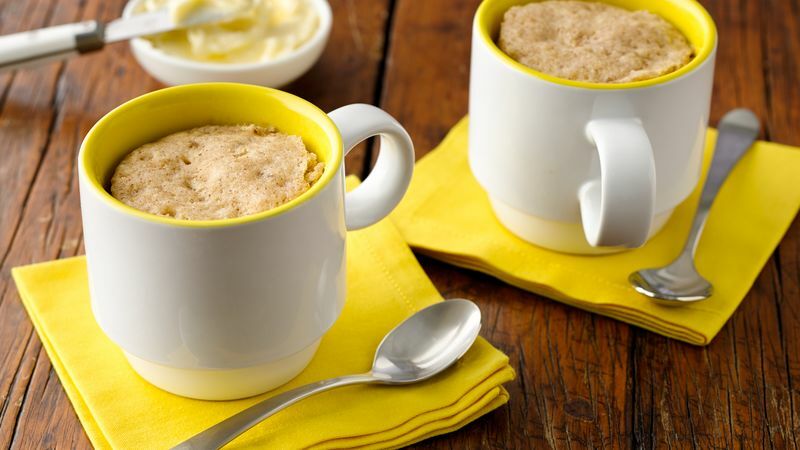 Serve warm directly from mugs. If desired, serve with butter. Microwave ovens vary in cook times, so please start with the minimum cook time and add time as necessary. Don’t have egg substitute in your refrigerator? Instead, beat 1 egg, and measure out 1 tablespoon. Either discard the remaining egg, or save for another use.